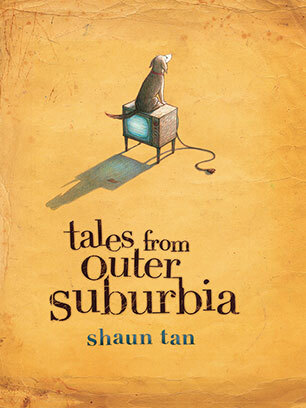 Tales from Outer Suburbia is a picture book for older kids, written by Shaun Tan, published by Allen and Unwin (2015.) RRP: $Au35.00. The publisher says the book is for children 4 - 8. I don’t agree. I wouldn’t read it to any four-year-olds I know, but I honestly think teens and adults would both appreciate it. I know I loved reading the stories. They induced a mood of quiet contemplation, and I spent some time thinking about what each short story had brought up for me. This year’s Children’s Book Week theme in Australia is Escape to Everywhere. I believe Tales from Outer Suburbia would make an excellent choice to use with senior primary and high school kids to explore that theme. It’s not just exotic locales we can escape to via books. Tan makes us look at our own lives with new eyes. Readers will love to peek inside the kitchen pantry at what Eric the foreign exchange student left behind, and perhaps check their own homes for little treasures. Any child will understand the compulsion to take the deep sea diver to Mrs Bad News, and ponder over what happened next. The stories give glimpses of our world, admittedly, but it’s our world with a surrealistic filter. There’s so much to wonder about and discuss, so many real and important issues touched upon that I believe a class could spend months studying the book. Book Chook Feather of Approval for this one!